Located in Barcelona’s emerging Poble-sec neighbourhood on a pedestrian street just off the energetic Avinguda del Paral·lel, Malamén is the area’s first swish restaurant, joining the handful of hipster wine bars and bodegas that gloriously spill out onto the city’s well-trodden pavements. Conceived by Venezuelan transplant Humberto Cruz and his Pamplona-born partner Daniel Gallego Garcés, the restaurant is a celebration of the duo’s shared family-orientated background, which revolves mostly around food. ‘Since I was a young boy, everything beautiful happened in a kitchen,’ recalls Cruz. ‘My grandmother went to the market daily to buy fresh produce to cook something fabulous.’ Cooked by Swedish chef David Elfsrand, the food is a mishmash of influences that forms a modern Mediterranean menu using seasonal produce. 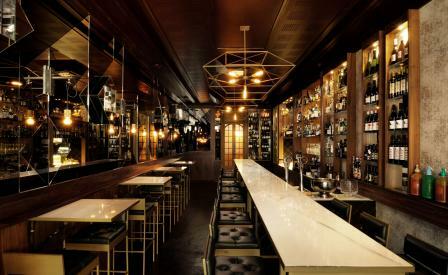 Nibble on crisp pecorino croquetas or fresh monkfish with scallops, clams and Galician lobster in a sleek space decked out by local outfit Florejachs i Orti, who made the most of the narrow confines with a wall of geometric mirrors and a single marble bar that runs the length of the room.